By Paul Byrnes Sydney Morning Herald Sept. 13th, 2015. This is the story of the canary who sang but couldn’t fly. That line is from Murder, Inc, a 1960 movie about the Brooklyn gangsters Louis “Lepke” Buchalter and Abe Reles. The latter was played by Peter Falk in one of his first movies – and it made his career. David Stewart played Lepke, who was a criminal genius. Both performances chill to the bone. There is very little sentimentality in this movie, based on a book by New York journalist Sid Feder and Burton Turkus, an assistant DA in Brooklyn in the early 1940s. Turkus put Lepke in the electric chair. The book came out in 1951, and so did the first movie to depict these same two gangsters. The Enforcer starred Humphrey Bogart as the Assistant DA, now called Martin Ferguson. Reles is called Rico and the movie begins with his death. It’s the manner of his death that interests me. Both movies show it and neither tells the whole truth about it. The 1951 gangster film The Enforcer, starring Humphrey Bogart, is highly fictionalised but the interesting bits are factual. In The Enforcer, directed by the superbly named Bretaigne Windust (Raoul Walsh took over when he fell ill), Bogart has Rico (Ted de Corsia) stashed in City Hall amid great secrecy. He’s due to testify against a mastermind called Mendoza (the Lepke character). Rico escapes through a bathroom window. Bogart tries to pull him back but Rico falls to his death. There goes the case, so Bogart and his police offsider try to find a new lead. The film is highly fictionalised but the interesting bits are factual. 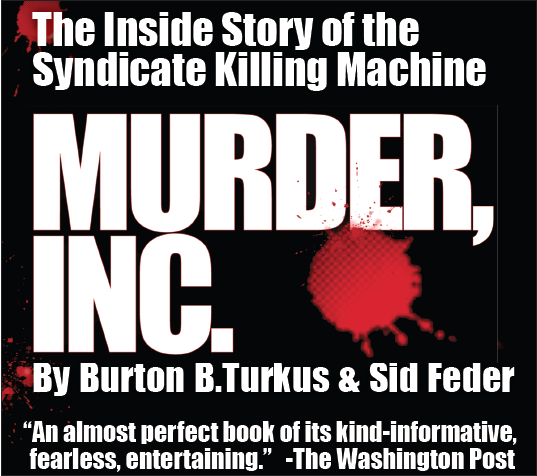 It shows how the assassination group known as Murder Inc started with teenage Italian and Jewish hoods, working from a lunch counter in Brownsville, one of the toughest parts of Brooklyn. It shows how Lepke developed the concept of contract killing, and the brilliance of the idea. His system divorced the killer from any connection with his victim, so that motive could never be a factor for police. It’s one of the first movies to depict the Mob, aka the Syndicate, in an organisational way. It’s also one of the most brutal films of that era. It’s nowhere near the violence that Martin Scorsese unleashed, but the American public was still credulous about the evils in their midst. Bogart and his offsider, Captain Frank Nelson (Roy Roberts), had to explain some new terms. Nelson: Yeah, he said it was a contract and she was a hit. Ferguson: Got any idea what he meant? Nelson: I have never heard it used in connection with a killing before. Americans who read the papers might have heard this term, but this was the first mention in a movie. Hollywood loved the idea: every contract killer since then flows from this scene. The real Abe Reles “fell” from a window in the Half Moon Hotel at Coney Island on November 12, 1941. He was under police protection. A grand jury concluded it was accidental. The other theory is six of New York’s finest shared $100,000 to do the job, financed by mob boss Frank Costello. Reles had already “sung” against a lot of his cronies in Murder Inc. His testimony would help to send seven of them to the chair, including Lepke, in 1944. Reles was about to testify against Albert Anastasia, co-founder of Murder, Inc. That was when he learned he couldn’t fly. Murder, Inc, from 1960, was directed by Stuart Rosenberg (and Burt Balaban, after Rosenberg was fired) and it ends with Reles’ death. The film uses some of the real names and gets closer to the truth. Henry Morgan plays Burton Turkus, as he goes after Reles and Lepke with the help of an honest cop, William Tobin (Simon Oakland), who is fictional. The real Reles favoured an ice-pick slammed into the brain through the ear. Peter Falk uses one, but between the ribs. In the final moments, we see someone approach his room in the hotel, which is unguarded. He falls from the window, but we don’t see how. Next morning, Turkus and Tobin are standing by the body. Turkus: Why would he want to get out – it’s the one place in the world he was safe. Tobin: It certainly doesn’t figure. Tobin: Every cop on the floor asleep? Tobin: He doesn’t fall straight down like a normal body. Without a grand jury implicating the police, the movie couldn’t say what everyone was thinking, but it got close. 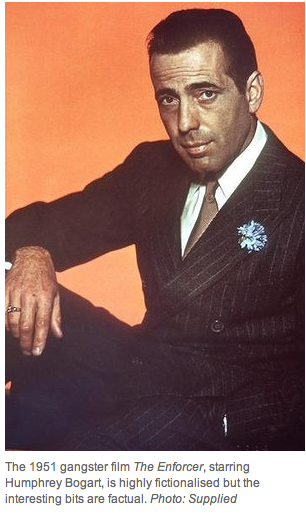 The earlier film squibbed it, when the Reles character falls from Bogart’s grip – no cops involved. It would have changed the course of the movie to show that, because Bogart would have had to go after the cops, not the crims – but it’s also indicative of the cosy relationship studios once had with law and order. Studios did not want to upset police departments, when they needed their help to make movies or cover up a star’s indiscretions. Reles’ death is unusual, in that it’s depicted in two movies, but neither dared to show what might really have happened.